the system is increasingly beating them into bankruptcy. Not everyone is able to look at the dark side of them selves, and doctors are no exception in this regard. But without such a journey it is almost impossible to fully understand the darkest side of humanity being expressed in the world of medicine. Most people in fact actively avoid looking at their own weaknesses and negativity and find no problem with pointing the finger elsewhere. Many would have us concentrate only on the positive, hoping that the bad guys would stop doing harm and just go away. Unfortunately the unlooked at dark side has the bad habit of hitting us from behind, blindsiding us to the point of extinguishing our lives. The medical establishment attacks people with sometimes lethal drugs and vaccines and condones dentists who continue to put mercury toxic waste dumps in people’s mouths. Death by Medicine is not uncommon these days and the healthcare reform bill in the United States does nothing to address the western medical system seems to butcher more people than it helps. We only hear in the news about unusual death occurrences. For instance health ministry officials in India have rushed a team of vaccination experts to investigate the death of four infants this week. Twenty infants below the age of two years were administered tetanus and anti-measles vaccine in a small town and four of these children, aged less than one year, died after vomiting and frothing from the mouth and nose. That’s a twenty percent kill rate. Deception can be deadly in Medicine and nowhere is that more evident than in the vaccine industry and cancer areas. Now we have a huge healthcare bill moving through congress and there is no doubt that it will bring a lot more deadly medicine for public consumption. House Democrats are on track for a Sunday vote on sweeping health care legislation that will expand coverage to millions of uninsured while also reducing the federal deficit, leaders said Thursday. The bill delivers on President Barack Obama’s top domestic priority by providing coverage to more than 30 million people now uninsured at a 10-year cost of $940 billion. It does so through a combination of tax credits for middle class households and an expansion of the Medicaid program for low income people. Do you believe this mainstream propaganda? Do you trust the United States government to do the right thing by its citizens? “Health care reform may be defeated this year in part because so many Americans believe the government can’t do anything right and fear that a doctor will come to resemble an I.R.S. agent with a scalpel,” writes Nicholas Kristof in the New York Times. Though there are good doctors there are no good health officials and most medical schools, teachers and medical organizations support pharmaceutical and medical terrorism. When you talk to people from around the world they cringe when they hear stories of forced vaccination and having chemotherapy rammed down your throat. The medical fascism if very strong in both the United States and England as well as in other parts of Europe. They should also fear that the Government will audit books of all employers that self insure and set the prices for all private health plans. Under this thousand page bill a government committee will decide what treatments/benefits you get. Healthcare will be rationed under the plan and the Health Choices Commissioner will choose your HealthCare benefits for you. Government will have real-time access to individuals’ finances & a national ID healthcare card will be issued. And lucky us, the Government will have direct access to our bank accounts for electronic funds transfer! The democrats’ health care bill puts the medical industry in even more control over peoples’ lives. When people like J.B. Handley talk about “bringing the U.S. vaccine program to its knees,” he is talking about the government and the pharmaceutical industry in the same breath because they are connected at the hip with no known surgery to break the two apart. When we talk about medicine we are talking about government and there is nothing nastier in the human universe as an unholy alliance between government, big companies and medicine – as history has shown in the past. The Business Roundtable, which represents CEOs from the largest U.S.
for businesses will rise 166% over the next decade, to nearly $29,000 per employee. President Barack Obama says his health care overhaul would be the most significant effort to reduce the nation’s deficit since the balanced budget act of the 1990s, which obviously did nothing in this regard as budget deficits have roared past the trillion and a half mark. Democratic leaders say the health care bill being considered on Capitol Hill is estimated to reduce the federal deficit by more than $130 billion over its first 10 years but that’s like spitting into a gale wind with red ink spilling all over Washington’s pavements. Do we want more government control and interference in the most personal areas of our lives? Medicine touches on our deepest vulnerabilities and when we look at the history of government and medicine we shudder at what might be coming. There is a direct line of continuity that can be traced between a group of men and companies that arose to the heights of industrial power years before Hitler, men and companies who existed and supported the rise of Nazi Germany, and who continue on to the present day in comfortable corporate luxury and power. Bayer experimental drugs were tested on Auschwitz prisoners. One of the SS doctors at Auschwitz, Dr. Helmut Vetter, a longtime Bayer employee, was involved in the testing of Bayer experimental vaccines and medicines on inmates. "there was created the largest and most powerful cartel the world has ever known. Not only has that cartel survived through the years, it has grown and prospered. Today it plays a major role in both the science and politics of cancer therapy,” wrote G. Edward Griffin author of World Without Cancer and The Politics of Cancer Therapy. Eustace Mullins described very well the roots of this nightmare and how John D. Rockefeller, with the help of the American Medical Association (AMA) and government officials, gained control of America’s "health" care industry in the early part of this century. "Rockefeller’s Education Board has spent more than $100 million to gain control of the nation’s medical schools and turn our physicians to physicians of the allopathic school, dedicated to surgery and the heavy use of drugs." in 1924 as a prescription drug in the United States. Pharmaceutical terrorism is a term I coined seven years ago when I published Cry of the Heart, a book about the tragic situation centering on the childhood vaccination program. That work reached its full expression in The Terror of Pediatric Medicine. A careful study of pharmaceutical terrorism entails taking a trip into the darkest places that exist in humanity and it is no accident that when we make the journey we find ourselves in places where doctors and scientists worked with the government as they did in Nazi Germany. The real history of modern medicine is best described by Dr. Mathias Rath who is without doubt one of the bravest physicians on the planet. He has taken his case against the pharmaceutical companies to the world court. He has also elaborated on how the World Trade Organization and even the European government in Brussels are tied into this entire nightmare. This all takes us to the bottom cellars of hell, into the deepest and darkest dungeon, into a place and into a type of person that defiles the very nature of beauty, love, a place where all human heart is lost. The Nazi doctors offer us a view of monsters that have remained invisible, dressed as they are eternally in three-piece suits or white lab coats. The Nuremberg War Criminal Tribunal convicted 24 IG Farben board members and executives on the basis of mass murder, slavery and other crimes against humanity. Amazingly however, by 1951 all of them had already been released, continuing to consult with German corporations. More importantly, for almost three decades after the Second World War, BASF, Bayer and Hoechst (now Aventis) each filled its highest position, chairman of the board, with former members of the Nazi regime. In 1998, the pharmaceutical giant, Bayer, conducted pesticide experiments on humans in what was called the Inveresk trials. Three years later the company behind the tests stands accused of breaking the Nuremberg Code. The Sunday Herald in England reported that subjects were given a single dose of a substance called azinphos-methyl (AM) and then observed for seven days. 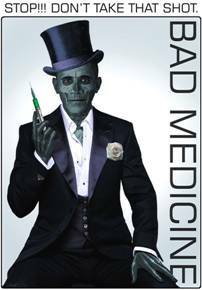 “American medical doctors have utterly failed the American people, their trusting patients. Millions of Americans are dying unnecessarily. They are the brutalized and agonized victims of indiscriminate manslaughter, crucified by the premeditated malpractice of a totally misinformed and misguided American medical community. Pharmaceutical and medical terrorism are in full bloom as recent events highlight. For starters Pfizer Inc., the world’s largest drug maker, will pay a record $2.3 billion civil and criminal penalty over unlawful prescription drug promotions, the Justice Department announced Wednesday. The department said the $2.3 billion settlement included a $1.2 billion criminal fine, the largest criminal fine in U.S. history. The agreement also included a criminal forfeiture of $105 million. We have become accustomed to the facts of life that include the presence of men and women who utterly fail their profession and all sense of humanity, men who do things that the rest of us cannot even begin to imagine. of academics who dare to tell the truth about Merck’s dangerous drugs. Doctors at the Nuremberg Trials were found in 1947 to be guilty of the most heinous crimes partially because they had the medical knowledge and skill to inflict terrible suffering and pain. Indecency certainly was common among doctors and medical staffs in Nazi Germany and today the legacy of these medical monsters lives on at the FDA where the betrayal of Americans, and the world, has been going on under the deceptive guise of protection. The FDA’s huge power to do wrong is founded in their ability to lie and deceive the public by declaring harmful toxic substances safe. a vast but slow poisoning of every man woman and child in America. Many ethical doctors and scientists around the world are not happy with the direction medicine has taken over the past several decades. Dr. Viera Scheibner gives us an explanation of why some doctors have fallen to such a low state. Dr. Scheibner is famous for her experiments measuring changes in breathing after the administration of vaccines but such basic science is not welcome in the orthodox medical community. Dr. Russell Blaylock tells us that it was actually the Rockefeller Foundation that created orthodox medicine back in 1901. “Rockefeller owned what was called the drug trust: that’s the major drug manufacturing firms all over the world: Merck Pharmaceuticals, Lederle, all of these pharmaceutical companies. And of course, the aim was to remove all nutrition, references to nutritional type treatments, from the medical schools. They closed down half the medical schools in the United States. There were 165 medical schools at the time. Then he had his anointed medical schools, which he poured his money into, appointed the professors from his own stock of professors. So what we know as contemporary medicine actually has a short and ruinous history of hurting people. It was started and controlled by unsavory interests, men and woman who can only be called beasts at heart. What they have done and are still doing to the children can never be forgiven. It’s hard for us to admit how badly we have been taken to lunch by the medical profession and how badly they act in our behalf.